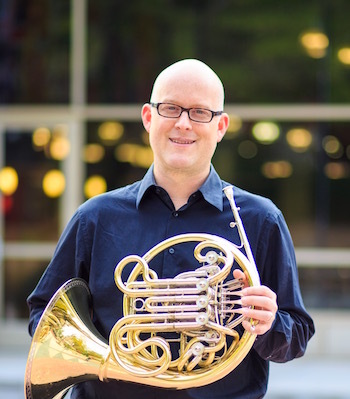 Dr. Jeb Wallace serves as full-time Horn Professor at Wichita State University, and maintains an active performance schedule as Principal Horn with the Wichita Symphony and Music Theater Wichita, and as hornist with the Wichita Brass Quintet and Lieurance Woodwind Quintet . He has performed throughout the country with numerous ensembles including the Utah Symphony, American Symphony, North Carolina Symphony, Richmond Symphony, Louisiana Philharmonic, Cleveland Orchestra, Boise Philharmonic, Erie Philharmonic, New Haven Symphony, and Dallas Wind Symphony among others. He has presented masterclasses and recitals at the Yale School of Music, Arizona State University, Ithaca College, the Swedish National Orchestral Institute, Oklahoma State, Boise State, University of Dayton, UC Santa Barbara, and many others. Dr. Wallace been featured at the Calgary Hornfest!, Park City Spring Chamber Music Festival, Beethoven Festival, Salty Cricket Composer's Collective, Performing Arts Institute at Wyoming Seminary, and a numerous regional and international symposiums of the International Horn Society. An advocate for contemporary music, Dr. Wallace has collaborated with groups such as the Ad-Venturi Horn Duo, Inverness Chamber Players, Alarm Will Sound, TACTUS, New Music New Haven, and the Stony Brook Contemporary Chamber Players, and has premiered more than a dozen new works featuring the horn. He is currently recording a CD of new works for horn for Beauport Classical. He has commissioned and premiered more than two dozen new works featuring horn, working alongside composers such as Robert Bradshaw, James Naigus, Scott Wise, Warren Benson, Eric Flesher, Peter Gilbert, and many others. Previously, Wallace served on the as Associate Professor of Horn at Utah Valley University, Visiting Professor at James Madison University, and horn instructor at Susquehanna University, and Dickinson College. He also served as Pre-College faculty at the Cleveland Institute of Music, Stony Brook University, the Performing Arts Institute at Wyoming Seminary, the Tuacahn Music Institute, and at the Gifted Music School in Salt Lake City. International Horn Society Symposium 45, Denton, TX, May 18, 2012. The Group for New Music, Brigham Young University, Provo, UT, April 5, 2012. Southwest Horn Conference, Phoenix, AZ, January 18, 2012. Guest Artist, Utah State University Horn Recital, Logan, UT, December 7, 2011. UVU Wind Symphony, Featured Horn Soloist, April 22, 2011. Park City Spring Chamber Music Festival, Park City UT, April 13, 2011. UVU Contemporary Music Symposium, Alpine Chamber Winds, Orem, UT, Apri 4-5, 2011. Oklahoma State University, Department of Music, Stillwater, OK, March 23-24, 2011. Ithaca College School of Music, Ithaca, NY, March March 9, 2011. Salty Cricket Composer’s Collective, Rose Wagner Theatre, SLC, UT, November 30, 2010.